Just in time for Valentine’s Day, Nintendo will be releasing a new revision of its popular 3DSXL handheld game console. Imaginatively titled the “new 3DSXL,” the new hardware features improved “glasses-less” 3D technology, a second analog stick and a host of other improvements, including some better processing guts to push Mario and the gang even faster than before. It comes in red or black and it retails for $199.99. So, why are folks paying twice as much as that—or more—for other people’s preorders? 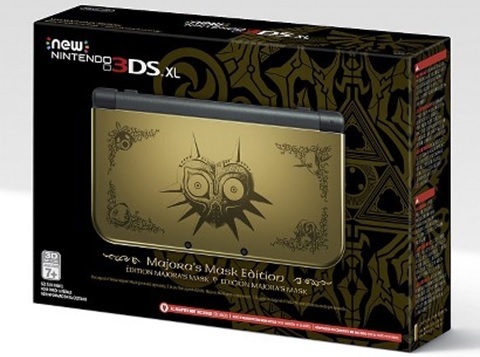 The Majora’s Mask 3DSXL is a must-have for any Legend of Zelda fan. But limited quantities and sold-out preorders everywhere online have made it a premium collector’s item—at least for the short term. Right now, you can go online and either buy yourself a receipt for a preorder at Amazon.com, Best Buy, Target or Gamestop to get your new 3DSXL when it comes out on February 13, or you can pay for someone to send you their preorder after they pick it up at the retailer of their choice. Mind you, if you just want the red or black model then you can just put your $200 down right now at any of those or other retailers and you’ll have it in time to gift to your beloved. Or you can likely just walk in any said retailer that weekend and buy it right over the counter. But if you want the limited edition, golden version festooned with livery from the classic Legend of Zelda game, Majora’s Mask—you’re going to have to pay the premium. Nintendo’s new 3DSXL is shipping in a special version commemorating the release of Majora’s Mask, formerly available only as an ancient Nintendo 64 cartridge or as a download for the Wii virtual console. It’s kind of a big deal for longtime Nintendo fans, as well as for those who have not yet played this excellent, critically acclaimed adventure game. I’m quite looking forward to the updated release of the game myself, and I’ve got my 3DSXL already paid for, so I can grab it on launch day. I attempted to preorder one of the Majora’s Mask editions but they literally sold out within minutes everywhere on Jan. 14. Throughout the day, online retailers would pop up with a couple more and there were forum posts everywhere entreating Zelda fans to get to a Gamestop or other retailer before they were gone again. It was a one-day feeding frenzy, and by the end of it, there were already $500- and $600-buy-it-now offers on eBay. Some were actually selling. 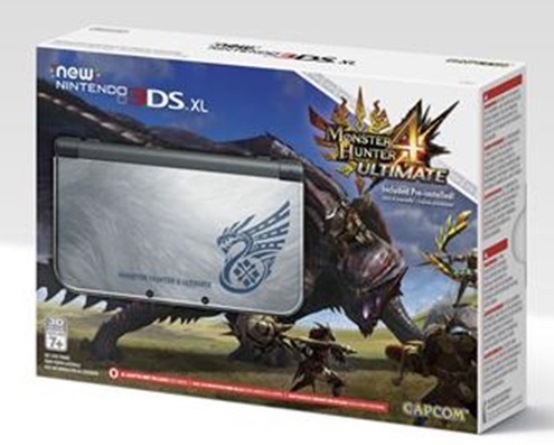 Another great-looking special edition for this year’s 3DSXL model, but another one that’s practically unavailable. Monster Hunter is nowhere near as popular as Zelda in the United States, but it still attracts a rabid fan base that bought every one of these Gamestop made available the day they were put up for preorder. But there is another to temp you, too. Nintendo is also releasing a Monster Hunter 4 special edition on the same day, which includes a download of that title—a game that has been wildly popular in Japan for years but has never gained a foothold in the U.S. I thought I would just grab one of those, but those dried up just slightly slower than the Majora’s Mask model. The problem here is that this edition is a Gamestop exclusive—no other stores will be carrying this package. Needless to say, this cool-looking brushed-steel model also experience an uptick in price, with online auction sellers looking for anywhere from $300 to $500 for this $229.99 retail product. But here is the reality check from a collector’s perspective. These special edition consoles—like any number of commemorative consoles, controllers, accessories and so forth—are going to have a very limited period of high value before they taper off to normal levels and the excitement of the cosmetic differences wears away. Right now, you might be able to double your money on a Majora’s Mask 3DSXL and you will likely be able to do so during the launch period, as those who want one bad enough to pay a premium will pony up for their treasure. That is, if it doesn’t turn out like past launches of hardware like this when it turned out that retailers get more shipped than they ordered. 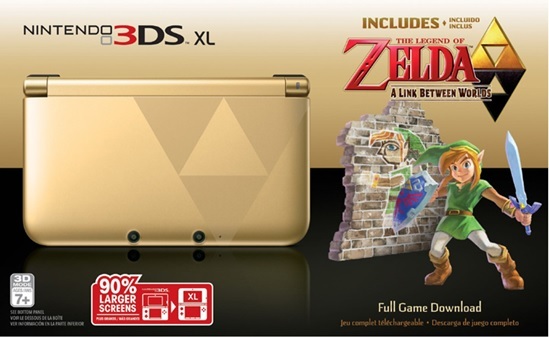 The last time a Legend of Zelda 3DS console released—to coincide with A Link Between Worlds two years ago—they also sold out immediately and skyrocketed in value. Yet, there were plenty of them in the shop I frequent for a few weeks after it was available. There was no shortage post-release. These days, you can get one for about $150—less than a new 3DS. And by Feb. 13, it will effectively be an old model. In five years, it will be a complete relic with that cool Triforce design on it, adding virtually nothing to the value. 2013’s Link Between Worlds model, which also had a huge value spike as preorders disappeared. But supply eventually outstripped demand, and it can be had now for less than the price a new 3DS. Interestingly, the Majora’s Mask edition does not include the actual game whereas this version—and the Monster Hunter one above—do. So, I am disappointed that I couldn’t get preorder one of the Majora’s Mask models—or the Monster Hunter one, for that matter—but truth be told, I viewed the cosmetic part of it as a bonus for a piece of hardware I was upgrading anyway. As someone very interested in buying, selling and trading games and gaming equipment, you better bet I would have sold my preorder as soon as I saw the market peak wildly in less than a day of availability. I can always slap a Legend of Zelda sticker on the back of my black one. As usual with any kind of limited edition video game equipment, my advisement remains the same—if you are a fan of the property or if there is a substantial benefit to purchasing one of these kinds of things, then there is an intrinsic value there. If, like me, you were going to upgrade or purchase anyway and the branding represents a cosmetic bonus, then there’s no loss. But consoles like the Majora’s Mask 3DSXL should not be regarded as having any kind of long-term investment value either for collectors or for game players. Michael Barnes is a lifelong game player, collector and enthusiast. He has parlayed his passion for games into several successful ventures, including a retail hobby store, two popular gaming Websites, and more than a decade of widely read commentary and criticism about both tabletop and video games.